We don’t have to tell you that the Girl Scout motto is “Be Prepared”. The motto, as explained in the 1947 Girl Scout Handbook, means “A Girl Scout is ready to help out wherever she is needed. Willingness to serve is not enough; you must know how to do the job well, even in an emergency.” One of the things we can often forget in our quest to be prepared are that rips and tears can happen, and sometimes a safety pin is not enough! 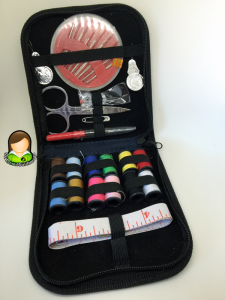 Here at Girl Scout Guide we were given a Quick Stitch Sewing Kit complimentary to review. 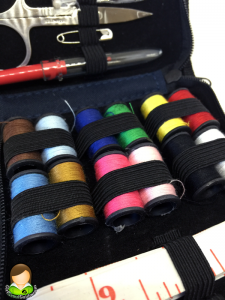 Having a sewing kit on hand is very important in all activities and travel – from troop camping trips to day trips, weekly meetings to awards ceremonies. You never know when a badge might come loose or an inconvenient hole may need a few quick stitches on the trail. 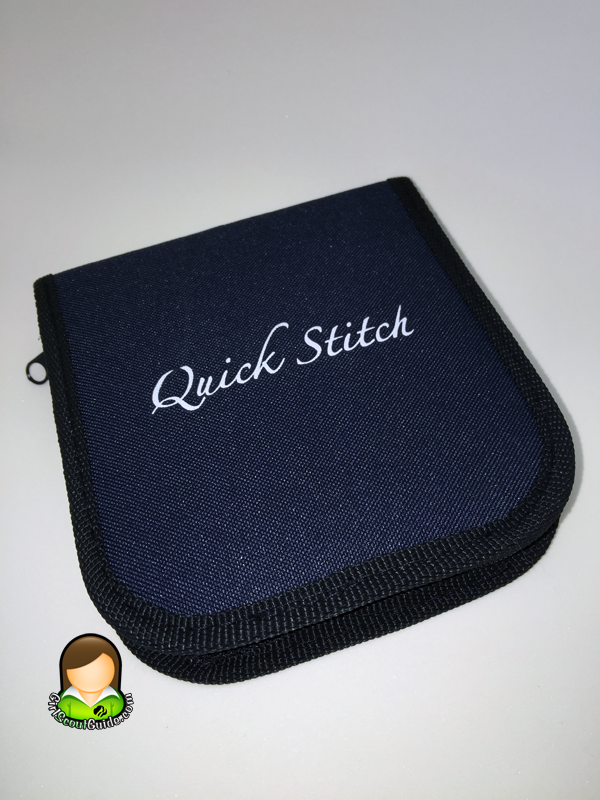 The Quick Stitch Sewing Kit is compact for sure – measuring at 4.5 x 0.8 x 4.8 inches it weighs just 3.7 ounces according to my package scale. It’s easily slim enough to fit unobtrusively in any duffle bag, backpack, or suitcase. 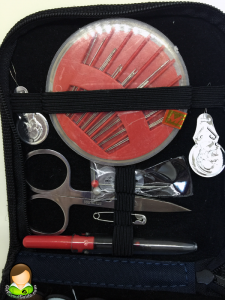 It contains 24 stainless steel needles in 8 sizes contained in a plastic case, 12 spools of thread in assorted colors, stainless steel scissors, a seem ripper with plastic cover, 2 aluminum needle threaders, a tape measure, 2 straight pins, 3 white opalescent buttons, a safety pin, and a thimble. It retails on Amazon for $11.95. The kit we received was actually missing it’s thimble, which isn’t a big deal to us because none of us use one, but it might be a big deal to you if yours comes up missing. For all that’s contained within this kit, it’s remarkably lightweight. It doesn’t add any bulk to a day pack or even a larger purse, though it might be somewhat cumbersome for a fanny pack or smaller purse if you travel light on troop outings. It is relatively thin, so it can easily tuck into some pockets out of the way within those larger bags. A distinct downside is that there’s only one lonely safety pin. Being the all-stars of any travel emergency, safety pins are invaluable when on the go, so we recommend tossing a few extra into your kit before heading out. While small, there’s still plenty of room within the zippered walls of this kit to hold some extras. The stainless steel scissors are a HUGE bonus and very easily justify the price. Yes, you can get less expensive travel sewing kits, but those flimsy scissors won’t work if some serious repairs are needed while out with your troop on a hike, day trip, or other situation where you may not have a real pair of scissors around otherwise. The seem ripper is also handy to clean up a mending job and not necessarily have to do more serious repairs once you get back home. It’ll be like it never happened! The variety of threads is nice, though they are rather small spools. They include your basic primary colors, the required black and white, and even some pastels and browns to cover your bases. There’s no orange or purple, but if you find yourself using more oranges and purples and less of the other colors, you could probably substitute some spools from cheaper travel kits or throw in a wound bobbin from home. The zipper is secure, so even if you include some other odds and ends like we’ve recommended, they won’t end up falling out all over your bag waiting to stab you or get tangled up in a zipper. The kit has hard sides, so you don’t have to worry about those pointy scissors poking through either. Whether you’re going out for the day with your troop on an adventure, or spending a few days reconnecting with nature on a camping trip, we highly recommend having this Quick Stitch Sewing Kit on hand. If the size is a little big for the type of bags you like to travel with, it’s also a handy item to have with your regular meeting supplies or “backstage” for an awards ceremony to fix up your uniform and patches in a pinch. The price might be a little high for you, but it’s actually on the less expensive spectrum of kits with comparable items inside that are on the market, so it is the best value for your troop budget dollars.